Wine & Dine: Australia - We got together to learn more about the cuisine and wines of Australia, with a few recipes to share. Neighborhood Taste Tour: Maxwell Street Market - We took a trip to this open-air market and got to indulge in some authentic Mexican eats, learn more about new fruits and vegetables and enjoy the sights and sounds. Now to start off this new week, I've got a special Foodie Freebie Friday. Aside from the great food and ethnic neighborhoods that make up Chicago, we certainly have our share of chef rockstars. One such rockstar is Grant Achatz. Grant Achatz grew up in the restaurants industry since his parents and grandparents owned restaurants in Michigan. Naturally, he decided to enter the culinary field and became a student at the Culinary Instititue of America in New York. Once he graduated, he worked his way up to a sous chef position after four years at Thomas Keller's renowned restaurant, The French Laundry. 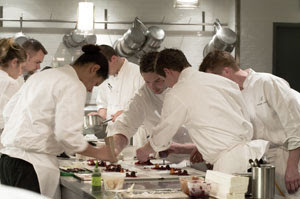 He then moved to Chicago to become an executive chef of the restaurant, Trio. He worked three years there before starting his own restaurant, Alinea. His culinary point of view takes on molecular gastronomy. Grant takes food to a whole new level and diners are immersed in an experience using all their senses - sight, sound, texture and taste. 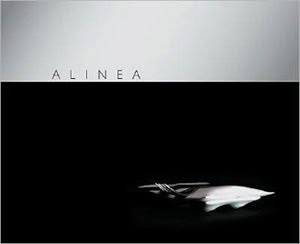 It's no wonder that Alinea was named the best restaurant in America in 2006 and is just one of sixteen restaurants in the United States that received 5 stars in 2007. 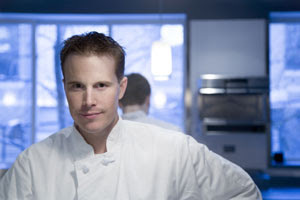 But 2007 was a difficult year for Grant, despite the accolades he received for Alinea. In July of that year, Grant was diagnosed with stage 4 squamous cell carcinoma of the mouth. He underwent aggressive treatment and before the end of the year, his cancer was in full remission. He continues to work on exciting creations at Alinea and just shy of a year after being cancer free, he published this week's Foodie Freebie Friday - Alinea. - If you lost your sense of taste, what foods would you miss most? Deadline: Thursday, August 20, 2009 at 12 midnight CST. ONE WINNER will be randomly chosen by Random. Org's Interger Generator based on the number of your comment and will be announced on Friday, August 21, 2009. Good luck! Mexican. I love the spices used and just everything about it. I would miss peanut butter. Definetely. I would miss eclairs....I love them, I love the chocolate, the custard filling and the light and fluffy pastry. To me, that is absolute food heaven. I tend to enjoy food for the texture more often than the taste alone, so this is a good question. Some of my favorite texture foods include quinoa, mousse and yogurt. I believe I would miss south Indian cuisine the most. I find the textures to be ordinary, but the taste and spices to be excellent. Oh, such a tough question! I don't even want to think about losing my sense of taste. I think I would miss peaches the most. They're my favorite fruit, and I am in heaven right now since it's peach season at the farmer's markets. I would miss chocolate and strawberries the most. Oh so many! Curry, red pepper, cumin. Anything spicy! I think it's a tie between peanut butter and chocolate. There are so many tastes I love, but I eat at least a little of both of those every day! I would miss vine ripe tomatoes dusted with fresh tender basil with fresh mozzarella accompanied with my fathers homemade Kalamata extra virgin olive oil. Chocolate and strawberries... on the savory side, garlic and onions. Life would be far worse without garlic! Mine is a tie between coffee and chips and dip. Nothing fancy but both so good! I think I would miss my favorite comfort foods the most - pot roast with mashed potatoes and gravy, meatloaf with mashed potatoes and gravy, and Rocky Road ice cream. Its hard to pick a single food I'd miss. Strong flavors would probably be the most missed as you are used to expecting the flavor. Probably something like tortilla soup would be the hardest as it combines things like cumin, cilantro, lime, tomato, and the heat and flavor of chilis. I would miss the taste of lemons. Lemonade, marinades, pastas- I just love the fresh tartness of lemons! Chocolate- hands down! I love it in many forms, ice cream, cookies, cupcakes. Garlic! oh god I would die without garlic! Wow, what a question. I would miss Caramel cake. Another vote for peanut butter! I would miss strawberries. They are my favorite fruit ever! I would definitely miss fresh fruit like strawberries, peaches and pineapple. CocaCola Chocolate Cake for sure! I'd miss toast with peanut butter and strawberry jam...my comfort food!! I'd miss citrus fruits...so bright and flavorful! Chocolate! Salsa ranks high too. Garlic! I couldn't live without it. For me, it would probably be burrito's! i have dreamed about eating at Alinea for years! Maybe as a celebration when/if i finish my graduate degree... the cookbook looks amazing. If i lost my sense of taste, i would miss certain sharp, poignant tastes that i adore: rich, aged balsamic vinegar is probably at the top of my list. Also French mustard. Although it's not a sharp taste, i would also miss the delightful vibrancy of the locally produced extra virgin olive oil i just tasted in Italy. Citric fruit. Bursting open an orange, lemon, lime, etc., you can almost, but not quite, taste the luscious flavor through its scent. A real tease, until you can actually taste. If I lost my sense of taste, I would truly miss all the different cheeses. Oh, how I love cheese. Pineapples and chocolates are probably next on the list. But cheese is my number 1. I love the taste of cumin and of garlic. I would also definitely miss chocolate and vanilla. At first I was thinking I'd miss chocolate the most, but after a few moments, I know I would miss the taste of a perfectly cooked, medium rare steak!! I would miss salty/savory foods the most - buttered popcorn, blue cheese,steak with garlic peppercorn rub. I would also miss this really good white wine I tasted/bought/consumed a month ago. I'd miss so much but I think what I would miss the most are being able to savor perfect hot/iced lattes and real French croissants. Those are subtle and satisfying flavors. I also love complex and robust flavors in foods, so I would miss spices and Greek feta too as well as so many other foods and tastes! cheese any cheese all cheese!